Tom Ford makeup. How do I even begin to describe Tom Ford makeup? The luxe packaging. The attention to detail. The quality of the products. Everything about Tom Ford screams class and indulgence. This palette is no exception. The eyeshadows are smooth and soft. 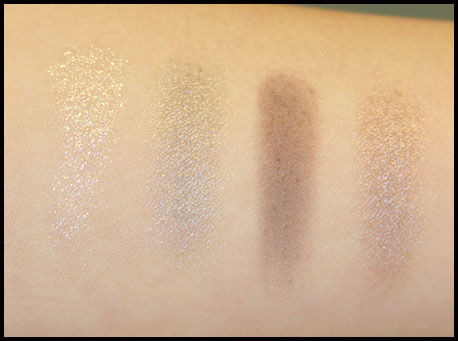 The Silvered Topaz palette has a glitter shade, two shimmer colours, and one beautiful matte brown. I find that Tom Ford eyeshadows are easy to apply, and blend beautifully. 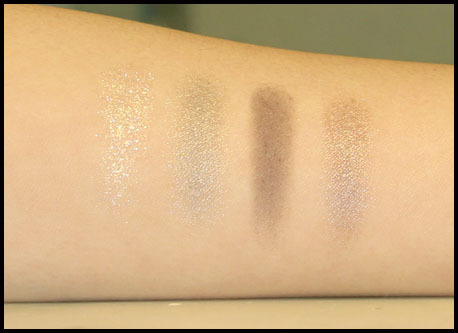 I would have preferred the two shimmer shades to be a bit darker and more pigmented, but the overall effect that they produce is still beautiful. I figured the best way to show you how this palette works is with a tutorial - I hope you guys enjoy this! Start with an eyelid primer. As mentioned above, I find that the shimmery shades are not as pigmented as I'd like, so this primer helps me pack on the eyeshadow more easily. Using a brush similar to MAC's #239 brush, pat the greenish shimmery shade onto the inner corners of the lid, bringing it in towards the centre of the eyelids. Then, pat the brown shimmery shade onto the outer corners of the lids. Using a MAC #217 or equivalent, blend the brown shimmer shade up towards the crease and slightly outwards. If you don't have a visible crease, run the matte brown shade where your crease should be, to create dimension. Line your lashline, winging the eyeliner out at the outer corners. I am using Clinique Brush On Cream Liner in True Black and a Skinfood Eyeliner Brush. Using your finger, lightly pat the glitter eyeshadow on top of your eye makeup. You can obviously skip this if this look is for daytime. Clean up underneath the eye with a concealer. I am using the equivalent of a MAC #219, and the Bourjois Healthy Mix Concealer in #51. Then, lightly contour underneath your cheekbones. I am using a Real Techniques Stippling Brush and the contour in the Tom Ford Shade and Illuminate duo. Apply a blush. I am using Tarte Amazonian Clay Blush in Dollface. Pat an illuminator onto your browbones to lift and enlarge your eyes. I am using the highlighter in the Tom Ford Shade and Illuminate duo. Finally, powder your makeup to set and keep it in place. And that's the finished look! The lasting power on these eyeshadows is average, but they are unaffected by slightly oily lids, which is a big bonus for me as my eyeshadows can sometimes crease because of the oil on my lids. The beautiful, unique colours get a big plus from me, though I wish they were a little more pigmented. The packaging is luxe, as always, and feels very sturdy. I may be biased because this palette seems to match and enhance my skintone perfectly, and I think that Tom Ford has a knack for doing exactly that. I always find that I have a certain glow about me when I use Tom Ford colours, and this is something about the collection that attracts me most. 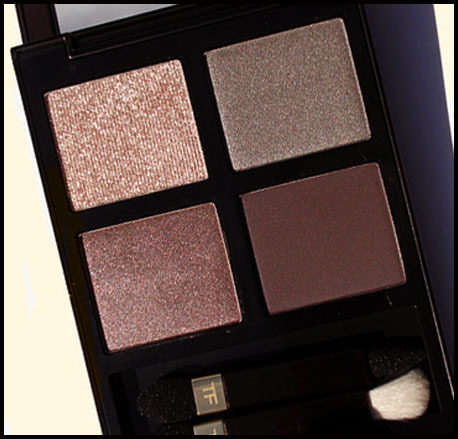 The Tom Ford Eye Color Quad retails for AUD 100 at David Jones in Sydney and Melbourne city.